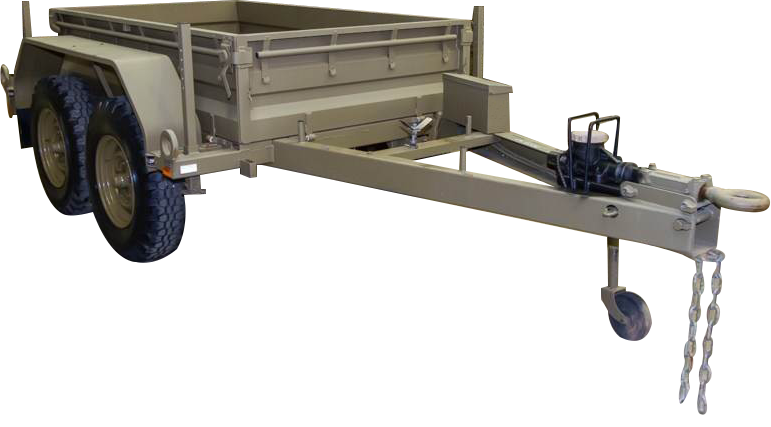 Single axle trailer featuring Disc Brakes coupled with Single Shoe Park Brakes, Rugged Off-Road Tow Ring and Master Cylinder set-up. Features Tandem Axle, Disc Brakes both axles, Single Shoe Park Brake and Rugged Off-Road Tow Ring & Master Cylinder set-up. Having its origins established in Melbourne about 40 years ago, Cebco Brakes harnessed its considerable knowledge on trailer brake systems to develop a brake program for Defence Department Light Duty Trailers built between 1995 and 2005. The development of this program incorporated some innovative designs as well as keen improvements to much loved Army favourites. Most hydraulic trailer brake systems use the pressure generated by the trailer pushing against the ‘braking’ tow vehicle (over-ride) to apply the brakes. This is acceptable under normal conditions but, can lead to instability of the ‘combination’…especially in rough or hilly terrain with heavily loaded trailers. With the introduction of the Cebco Light Duty Trailer Brake System, the difficulty of brakes applying in undesired circumstances has been removed. A number of exclusive features are incorporated to provide powerful progressive braking and excellent durability under the most wide ranging operating conditions. This system is vital for Military applications and any other Heavy Duty applications where performance and reliability are of utmost importance.